(January 1, 1752 – January 30, 1836), was born Elizabeth Griscom and is widely credited with making the first American flag but there is no evidence that the tale is true. Elizabeth Griscom, a daughter of Samuel and Rebecka (James) Griscom of Philadelphia, was born January 1, 1752, the eighth of seventeen children. The family were members of the Society Friends and the young Elizabeth grew into a most charming, bright and beautiful girl of prepossessing manners and plain and quiet tastes. Her great-aunt Sarah Elizabeth Ann Griscom taught Elizabeth how to sew. Her father was a noted builder and assisted in the erection of the state house, now Independence Hall. His house, shop and a very large garden were on Arch street, between 3rd and 4th streets. Elizabeth, or Betsy, as she was fondly called, was the seventh daughter. Her birthday was the first day under the new Gregorian calendar. It was frequently said by the family that "she was born the first day of the month, the first day of the year, the first day of the new style." She was well trained by her mother, became very expert with her needle and was very fond of embroidery. In December, 1773, at the age of twenty-one years, Elizabeth married John Ross, an estimable young man. He was an Episcopalian, and in consequence of her marrying out of meeting, she was disowned by the Friends. He was a son of Eneas Ross, assistant rector of Christ Episcopal Church. The young man was a nephew of the Honorable George Ross, delegate to Congress, one of the signers of the Declaration of Independence. The Rev. George Ross, of New Castle, Delaware, had by his first wife, two sons: John, who died May 5th, 1776: and Rev. Eneas, born Sept. 9th, 1716, who was father of John Ross (husband of Betsy Ross). By his second wife he had Hon. George Ross, signer of Declaration of Independence, born 1730, died 1780; also one daughter, Gertrude, who married George Read, also a signer of the Declaration of Independence; also a son, Jacob, a physician. The Honorable George Ross was a noted lawyer, and a resident of Lancaster. He was a brave soldier and a man of ability. John Ross was an apprentice with a man named Webster, an upholsterer on Chestnut street. It was with him that John and afterwards Betsy, learned the trade before they "ran off" to be married. John and Betsy Ross set up an upholstery business for themselves, first on Chestnut Street and afterwards moved to the little house on Arch street, which was a simple building when first occupied by them. It was built some time after 1752, notwithstanding romantic stories to the contrary. The first room was utilized as a shop; the store front not having been added until about 1858. It was in this house that the flag was made later on. In 1775 John Ross was injured while guarding military stores on the wharf, from the effects of which he died at this house in January, 1776. He was buried in Christ Churchyard, 5th and Arch streets. He left no children. Mrs. Ross continue her work in the upholstery business making tents and blankets for the war effort. Zillah, born September 15th, 1779. Eliza, born February 25th, 1781, who married Capt. Isaack Silliman, May 29th, 1799. After Capt. Silliman's death in the army, his wife Eliza lived with her mother, Betsy Ross, until her death in 1836. It was during this period that she was credited with making the first Flag of 13 circular stars in 1777. Although, this claim remains quite controversial, it is known that in 1779 she actively stuffed paper tube cartridges with musket balls and repaired Continental Army uniforms. In 1780, Captain Ashburn's ship was captured by a British frigate. In England, he was tried for treason, imprisoned, and died in jail. "In this pew worshipped Betsy Ross, who made the first Flag"
Six months after the passage of the Preliminary Treaty of Peace, Betsy married John Claypoole an old friend of the family. Together, the couple had five daughters. The growing family moved to a larger house on Second Street where they continued the upholstery business. During this period, Betsy Ross left Christ Church and became a member of the Free Quaker Society after it was organized in 1793. John Claypoole died in 1817 and Ross continued the family business until 1827 when she sold the house and moved in with her daughter, Susanna, in Abington. Here she lived to be 84 years old and died in 1836. Betsy is buried in Mt. Moriah Cemetery in Philadelphia. A flagstaff over her grave, from which a flag floats, was erected by the Sons of Veterans, U. S. Grant Post, No. 5, of Philadelphia. BEFORE we emerge from the field of speculation as to the origin of the Stars and Stripes, we must get through the thicket of the Betsy Ross problem. This last difficulty is not an easy one to face, for the tradition of the making of our first complete national Flag in old Arch Street, Philadelphia, has become almost a fetish with good Americans. There are countless thousands of men and women in the United States who accept an historical narrative, especially if colored with a hue of romance, without a moment's investigation into its merits as truth. The Betsy Ross story, first given to the public in 1870, almost a century after the event it is supposed to prove, has gone into book after book as solid truth. Like the legend of the boy George Washington and his hatchet, it is neat but suspicious. Recently a perfectly sane man came into our office and, with the air of one who had a real message to unfold, told us that near his home in a city in Western Massachusetts lived a niece of Betsy Ross. The estimable woman, gifted with a keen memory, had a fund of anecdotes of the life of the real Betsy, and was accepted by her neighbors as a bona fide link with a wonderful Past. 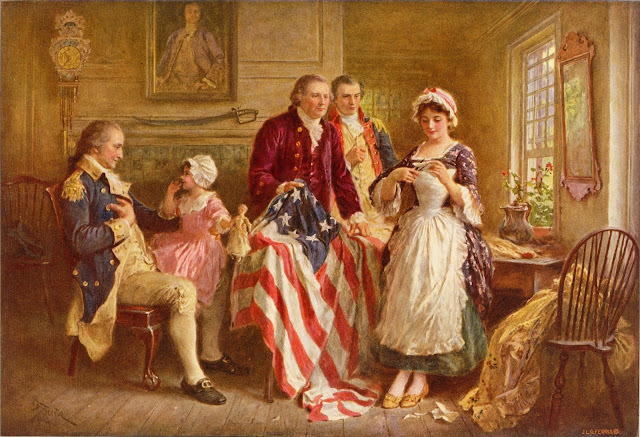 Betsy Ross was born in 1752, one hundred and sixty-seven years ago. We handed our visitor a scrap of paper, on which was the result of a little example in subtraction in terms of years. 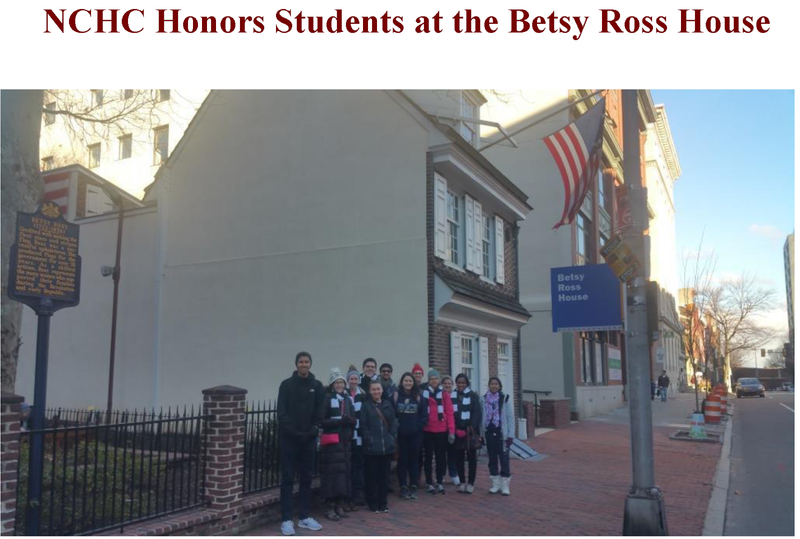 "How old would your niece of Betsy Ross have to be, to have memories of the living Betsy Ross?" we inquired. He never had thought of that. Like many others, he had accepted as fact what a few minutes of analytical thought would have shown to be an impossibility. 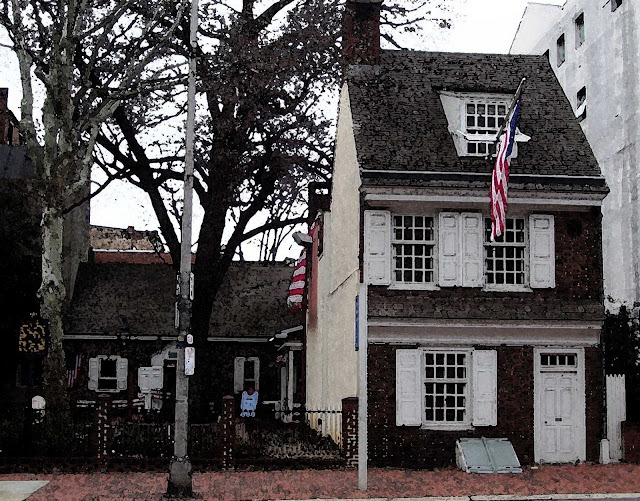 We are not on the verge of an effort to demolish the story of Betsy Ross and the making of the first Stars and Stripes. The weight of the evidence appears to be in favor of this tradition of the making of the original Old Glory. Were it not for the injudicious claims of certain members of the Ross family, claims utterly unnecessary and even dangerous to the life of an episode accepted as fact, though fragile, we should be inclined to set the whole matter down in this book verbatim, in accord with the evidence as presented by counsel for the defense. 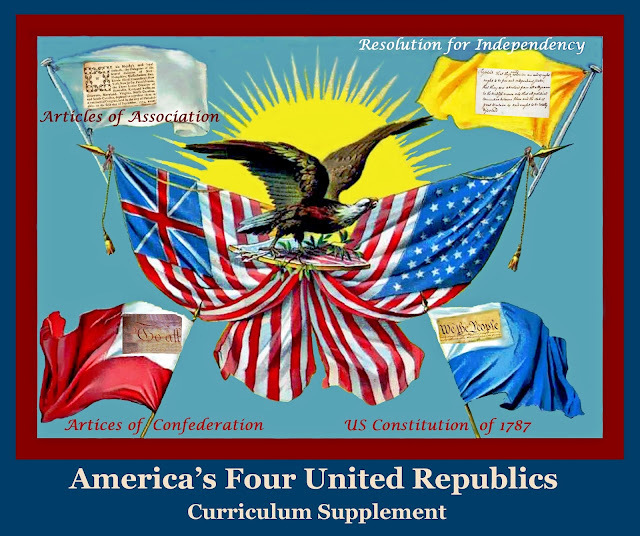 The story, in brief, is as follows: According to at least one historian, Betsy Ross made State colors for ships before the Flag-Resolution of Congress, of June 14, 1777, determined the Stars and Stripes as the national standard. She was engaged in flag-making for the Government after that date, and her daughter, Mrs. Clarissa Wilson, to whom we owe much of the accepted tradition, succeeded her in business and supplied arsenals, navy yards and the mercantile marine with flags for years. The main elements of the story are in the fragments we now present. Betsy Ross was the widow of John Ross who died from the effects of injuries received while guarding cannon balls and military stores which had been made by his uncle, George Ross, a signer of the Declaration of Independence. She had embroidered shirt ruffles for Washington in the days before his appointment as Commander-in-Chief of the Army, for she was famous for her work with the needle. 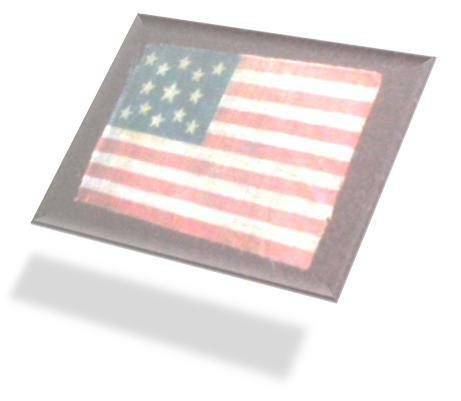 It was natural that Washington, with her uncle, George Ross, and Robert Morris should go to her for the making of a sample flag. These three men are supposed to have formed the committee, authorized by Congress or self-appointed, to "design a suitable flag for the nation." It is a pretty picture. We can imagine the three men bowing graciously to the young widow, then in her twenty-sixth year, and, after being seated, presenting, in the hands of Washington, a rough drawing of the proposed flag. The design shows stars with six points, to which Mistress Betsy objects. She folds a piece of paper and produces, with clips of her scissors, a perfect five-pointed star. Washington redraws the sketch, and the committee unanimously votes to give her the commission to make the first true American Flag. 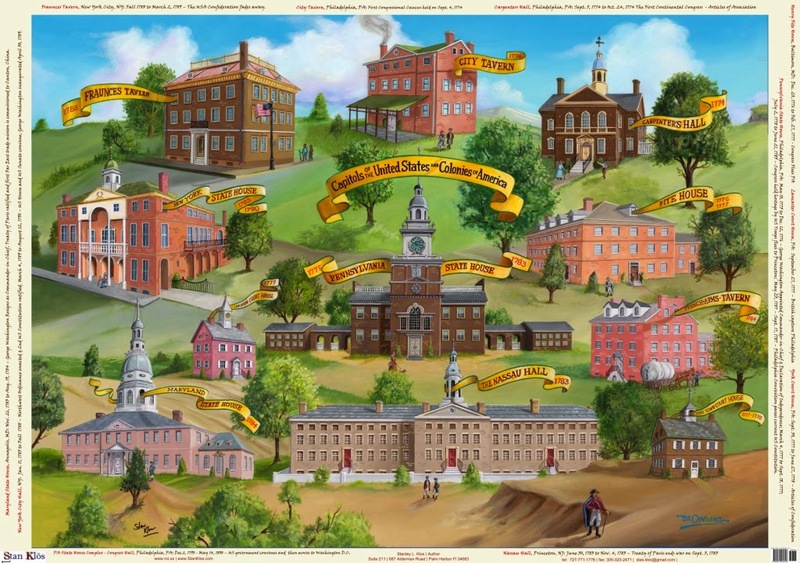 As George Washington was not in Philadelphia at any time during the first six months of 1777, it is a real problem to fit him into this picture. We are to find out, at once, how one man solves this problem by getting a Stars and Stripes made by Betsy Ross at some time in 1776, and thus making the great George a possible actor in the little scene. 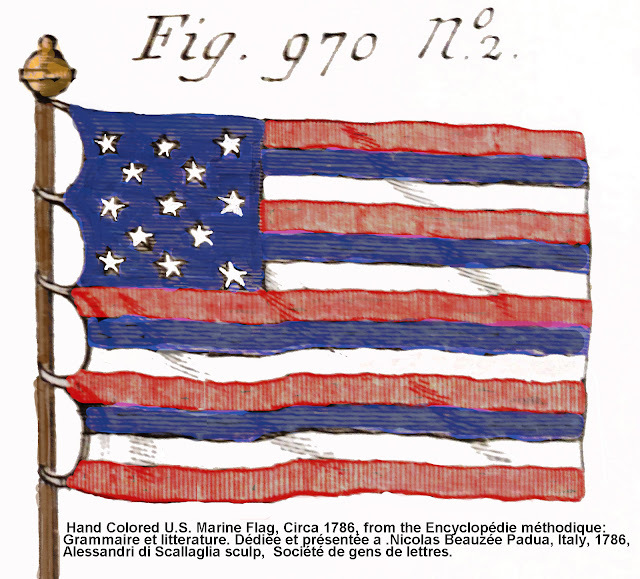 The claims of Mr. William J. Canby, a grandson of Betsy Ross, assert that she made flags of the Stars and Stripes pattern as early as June, 1776, when Washington chanced to be in Philadelphia, and that they were in common use soon after the Declaration of Independence was signed. 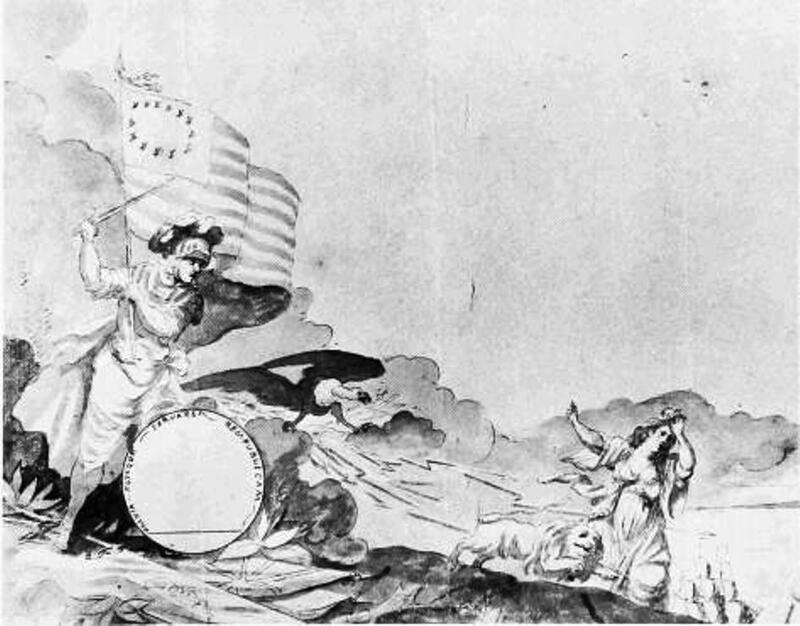 Mr. Canby was eleven years old when Betsy Ross died in 1836, yet he waited until 1857 before crystallizing in writing her relations of reminiscences of events associated with the Flag. That gap of twenty-one years before the committal of historical data to the stern rigidity of printed words, injures the value of Mr. Canby's interesting contribution to the literature of the Flag. 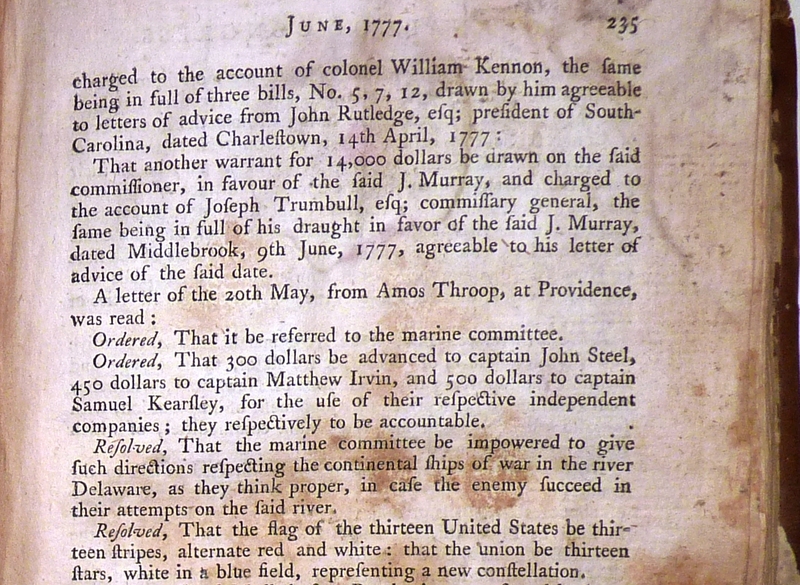 Another argument against the possibility of the Stars and Stripes being in use as early as June, 1776, is found in the words of John Paul Jones, "The flag and I are twins," uttered when he was told that his appointment to the command of the Ranger was of the same date as the Resolution in Congress, of June 14, 1777, that adopted the Stars and Stripes as the national emblem. Paul Jones loathed the Rattlesnake Flag, frequently displayed on ships of our little navy of 1776-77, and was precisely the man to seize upon and run to a masthead such a glorious emblem as Old Glory, were it in existence prior to June, 1777. You may scrutinize all the records of the Revolution, Congressional files, daily papers, prints, documents in European museums and libraries; you will not find a scrap of evidence the size of a ten-cent piece in support of the Canby theory. 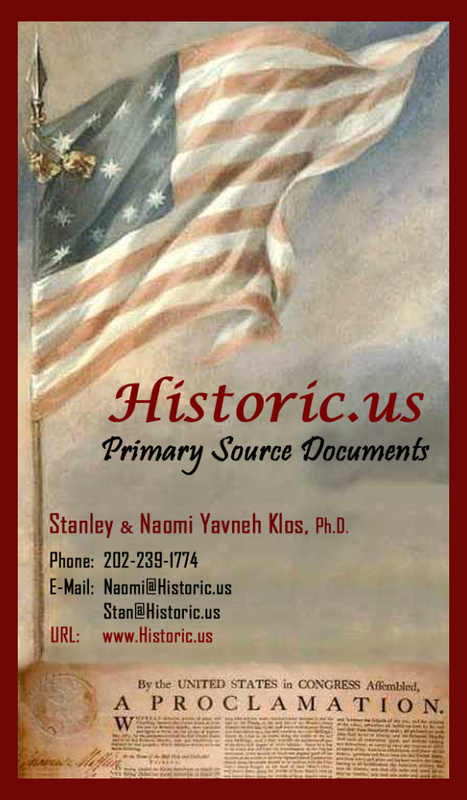 This claim is a distinct drag on the progress of the Betsy Ross legend, for it stresses an argument based on hearsay, oral transmission, when the truth we seek is that lodged in the written or printed memorials of the period. Resolved, That the flag of the thirteen United States of America be thirteen stripes, alternate red and white; that the union be thirteen stars, white in a blue field, representing a New Constellation. 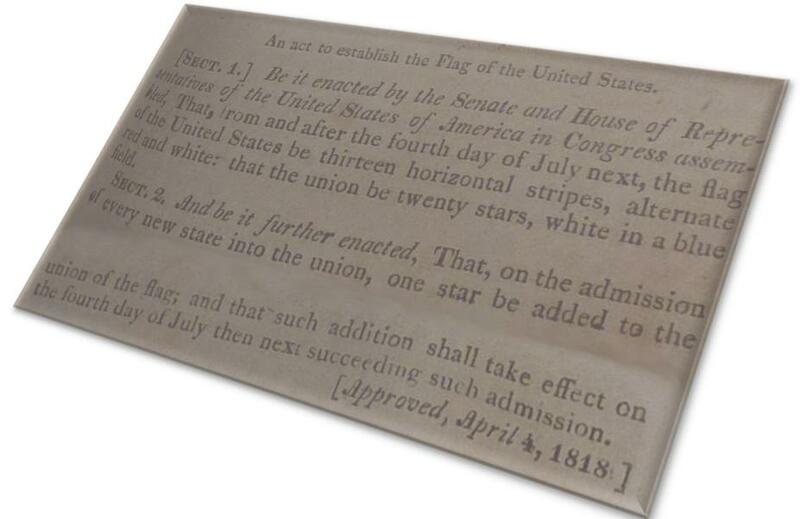 With that date and that Resolution, began the history of the Stars and Stripes as a living symbol of Nationality. There will be a few events associated with the early records of the Flag, as we are to give them, that will require careful attention, as they are not presented clearly in other histories of the Flag, or have been neglected. But we are out of the period of extreme uncertainty that prevailed during the years of the Continental standards of 1775 and 1776. The 1777 Flag Resolution, as evidenced in the Journals of Congress, was meant to define a naval ensign (or naval national flag) and did not specify any particular arrangement, number of star points, nor orientation for the stars. 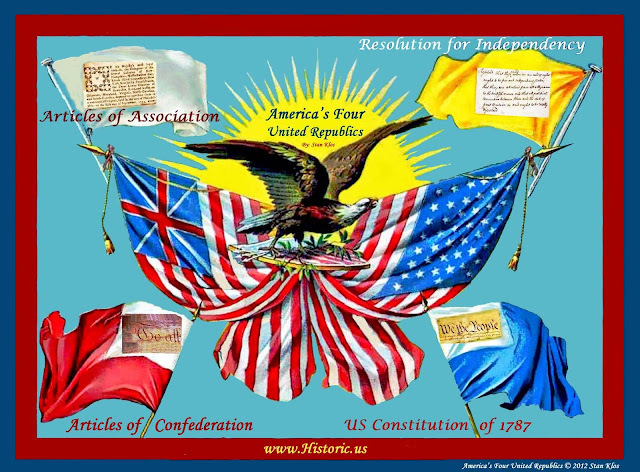 Consequently, the archaeological and written evidence on the numerous flag designs is sketchy and it is unknown which design was the most popular during the the 1777-1789 US Founding period. The three most notable early 13-star arrangements are the Francis Hopkinson Flag, the Brandywine Flag, and the Betsy Ross Flag. 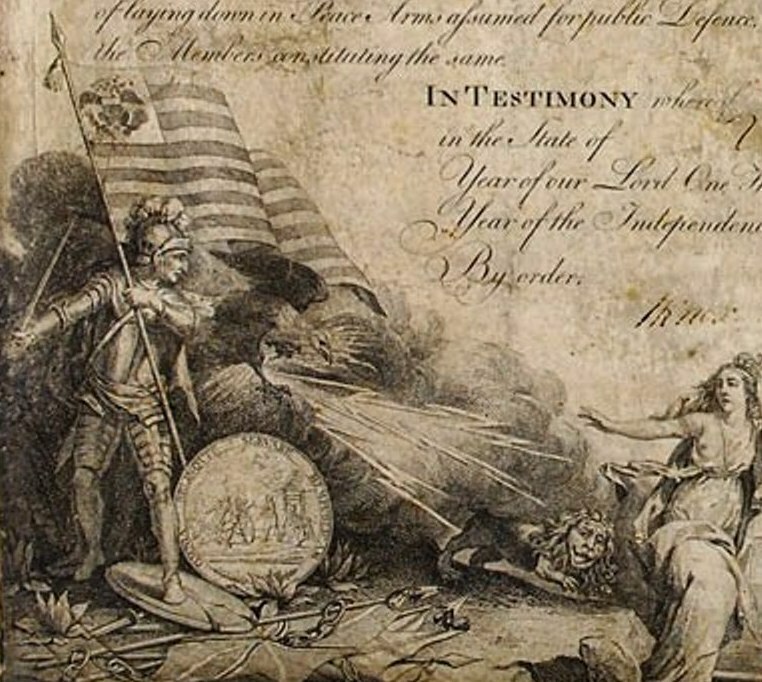 Painter John Trumbull (1756–1843) used Declaration of Independence Signer Francis Hopkinson's US Flag Design in his paintings of scenes of The Death of General Mercer at the Battle of Princeton, The Surrender of the British General John Burgoyne at Saratoga, and Major General Charles Cornwallis' surrender at Yorktown - Circa 1785-1822. During the Battle of Brandywine, this banner was carried by Captain Robert Wilson's company of the 7th Pennsylvania Regiment. The company flag is red, with a red and white American flag image in the canton. There is no evidence to support the Betsy Ross legend of sewing the first flag from a pencil sketch given to her by Commander-in-Chief George Washington, or teaching him how a five-point star is more simply cut than a six. 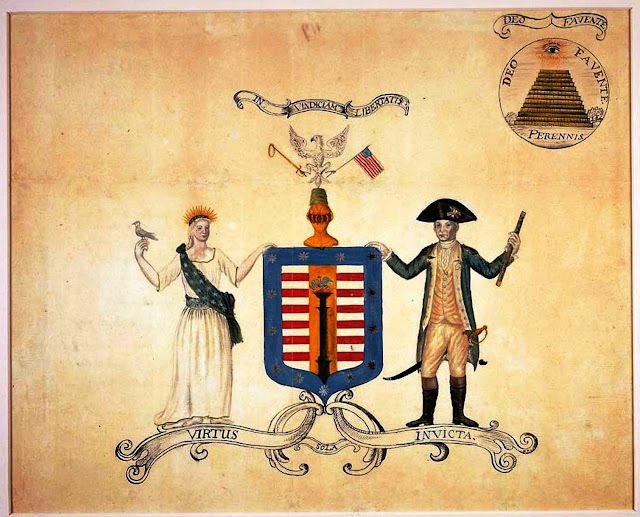 Betsy was one of a number of women who made flags, in a variety of styles, in Pennsylvania during the late 1770's; Benjamin Franklin and John Adams described the flag to the Neapolitan ambassador in 1778 as bearing stripes in red, white and blue! 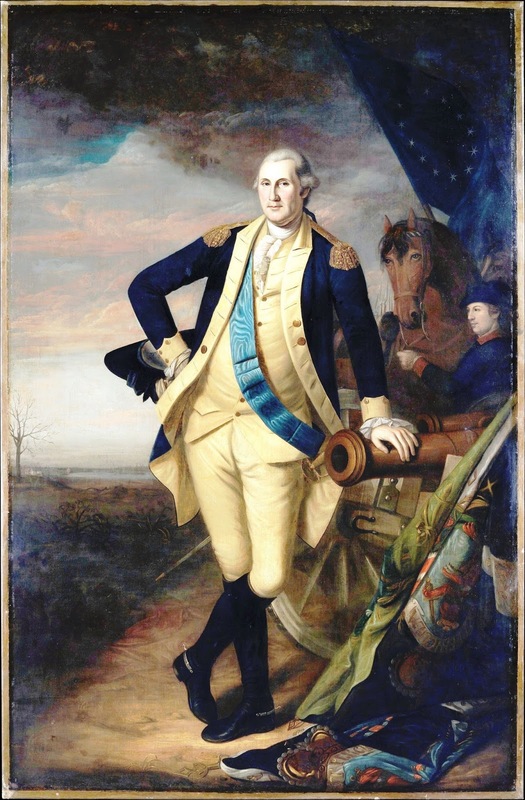 On January 18, 1779, the Supreme Executive Council of Pennsylvania passed a resolution commissioning a portrait of George Washington for the Council Chamber and selected Charles Willson Peale as the artist. In preparation, Peale traveled to the Princeton and Trenton battlefields in February of 1779 to make sketches for the background. The original portrait, the full-length version now in the Pennsylvania Academy of Fine Arts, was a tremendous success and Peale completed numerous copies for royal palaces abroad, each time updating the general's military dress. Peale's depiction of the round thirteen star field in the U.S. Flag remained constant. Also of note, the third United States in Congress Assembled committee convened to create a US Great Seal met on May 4, 1782. They consulted William Barton, a student of heraldry whose sketch incorporated the eagle for the first time on the Great Seal. The 13 star round flag was also part of the design but unlike Hopkinson's design the the 13 stars were all in ring rather than 12 stars and one in the middle. 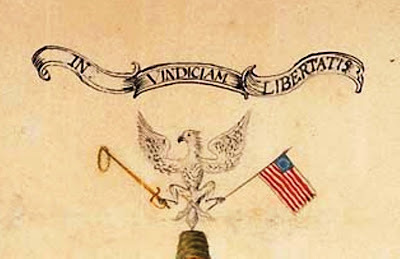 Major Pierre Charles L'Enfant adopted the thirteen star circle flag in his June 10, 1783, Society of Cincinnati Diploma design. 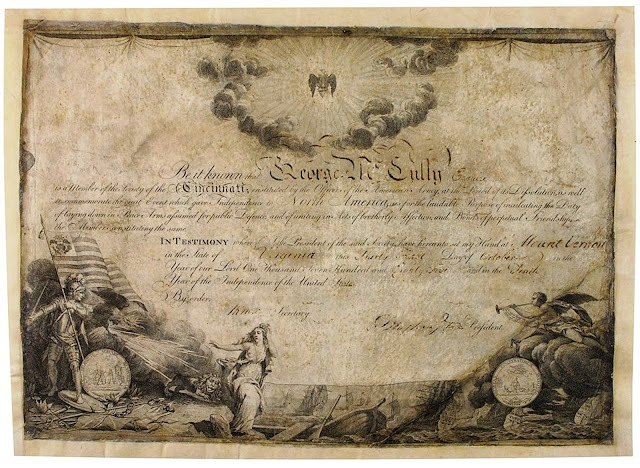 Major Pierre Charles L'Enfant Society of Cincinnati Diploma design, June 10, 1783 - Image Courtesy of the Library of Congress. In 1785 The Society of Cincinnati replace its 13 star field with the United States Great Seal as evidenced by this Diploma Signed by Society Secretary Henry Knox and President George Washington. The New York Historical Society reportedly owns, which they claim is the oldest known variation of the round 13-star flag. 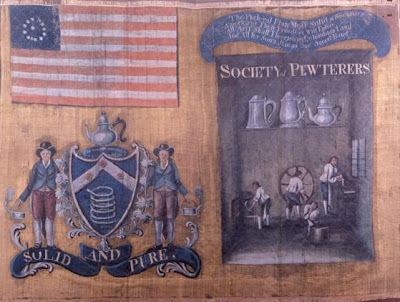 The flag, pictured below, was incorporated into the Pewterers' Banner that was flown by their delegation while they marched in NY's "Constitution of 1787" ratification parade in 1788. 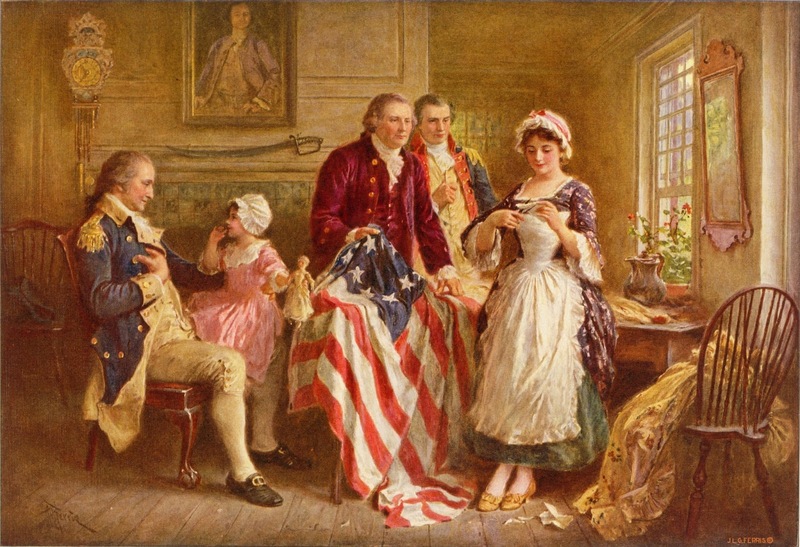 Finally, regarding the US Founding Flags, we do know that the story of Betsy Ross sewing the flag emerged during the Centennial Celebration festivities in 1876, and that the most popular thirteen-star flag of the ceremonies was an amalgamation of the Hopkinson and "Betsy Ross" designs. A copy of this centennial flag is included in the exhibit. 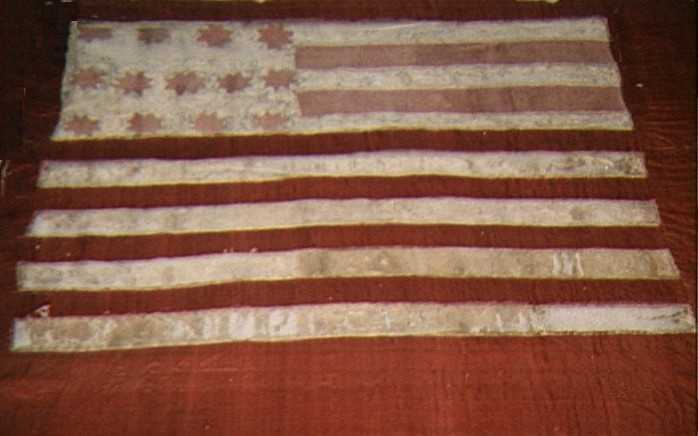 In 1795, the number of stars and stripes was increased from 13 to 15, reflecting the entry of Vermont and Kentucky as 14th and 15th states in the union. The Flag was not changed when subsequent states were admitted and with 18 states waging a second war with Great Britain, the 15-star, 15-stripe flag inspired Francis Scott Key to write his "Defense of Fort McHenry," now known as the U.S. national anthem, "The Star-Spangled Banner." 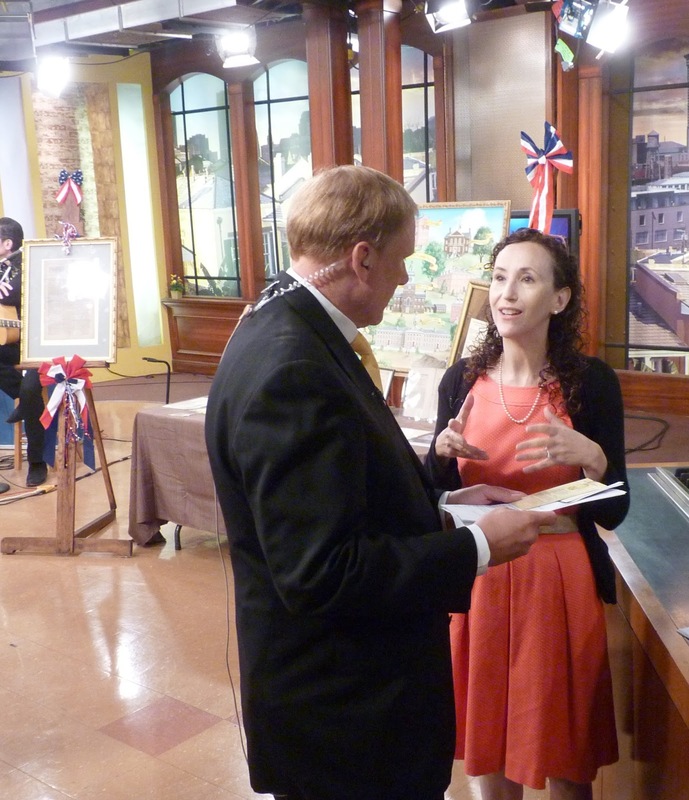 Dr. Naomi Yavneh Klos, July 3rd, 2013, on the set of CBS Morning News explaining the origin of the United States Flag. 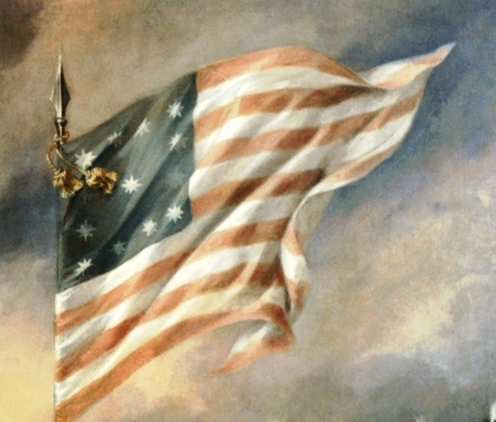 The History of the First United States Flag And The Patriotism Of Betsy Ross, The Immortal Heroine That Originated The First Flag Of The Union. Some years since William J. Canby, the grandson of Mrs. John (Betsy) Ross of Philadelphia, read before the Historical Society of Pennsylvania a paper on the Centennial Anniversary of the American Flag, in which he claimed that his grandmother was the first maker of the Stars and Stripes. She lived in Arch street, and was for many years engaged in the business of flag making. In this monograph Col. Reigart asserts that her bright colored tapestry, ornamental handiwork and curtains in primary colors attracted the notice of the members of Congress, and that at the request of Dr. Franklin, Mr. Robert Morris and Col. George Ross, her brother-in-law, she designed and made the first flag of the United States, which was approved and adopted by the committee and Congress. In addition to this, Betsy Ross first gave a name to our youthful country by marking on her flags the " United States of America." copyright 2012 Stan Klos. Picture Window theme. Powered by Blogger.